From left to right: Brandon, Jordon, Josh, Shani, Steve and Jane. Welcome to Red Truck! We’d like to tell you a little more about ourselves and what we do. Opened in the spring of 2002, Red Truck Automotive is owned and operated by Stephen and Jane Leigh. Both Stephen and Jane were born and raised in Orillia. Stephen has been working as an automotive technician and business owner for over thirty-five years, and Jane has worked in sales and customer service for over thirty. 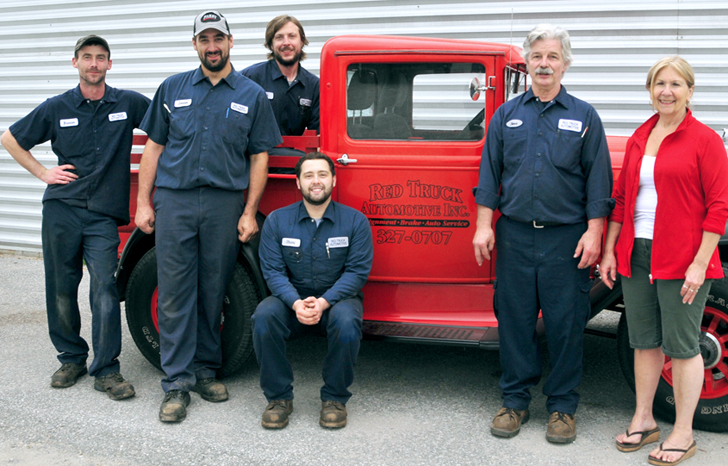 Since opening, Red Truck Automotive has grown quickly from one technician and an apprentice to five technicians, with combined experience of nearly one hundred years. Our goal is to provide prompt, quality service at a fair price for whatever kind of vehicle you drive. Our expertise covers a full range automotive services – diagnostics, maintenance, and repairs to both domestics and imports. We are well known for our alignment and suspension work, which we do for about a dozen local dealerships and independent shops. We also love problem-solving. From odd electrical glitches, to strange noises, to unusual driveability issues, to all those annoying dash lights, we are dedicated to finding solutions when things get complicated. We can also provide full maintenance for your car or truck. From oil changes, to brakes, to transmission service, to timing belts, tires, air conditioning and more. In fact, if its got four wheels and needs attention, chances are we can take care of it for you. To provide service to such a wide variety of vehicles and systems, we constantly invest in equipment, training and information. You can rest assured that we have access to high quality tools and manufacturer specifications for your vehicle, including maintenance schedules. Maintenance work done at our shop will not interfere with your factory warranty. So whether old or new, car or truck, we invite you to make us your ‘go to’ garage. We strive to provide a one-stop shop for all the needs of your family vehicles, from complex repairs to simple questions. So thanks again for giving Red Truck Automotive a try. We hope you do again, and we’ll do our best every time to make sure you’re glad you did.